THE PICKIEST EATER IN THE WORLD: ARLA POP UP AT SM AURA PREMIER: LET THE GOODNESS IN! ARLA POP UP AT SM AURA PREMIER: LET THE GOODNESS IN! 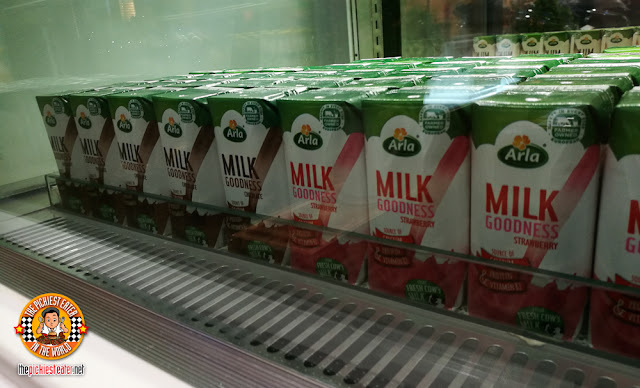 It was only 2016 that I first heard the name "Arla", not realizing that its products, including that of it's sister companies, have been a part of my life for quite some time. My cousin posted on his facebook page, a picture of a delicious piece of toast, smeared in cream cheese with a jar of "Arla" in the background, and raved about how delicious it was. After that I was rather intrigued. During my next trip to the Supermarket, I chanced about a small Jar of Arla, and was pleasantly surprised with how affordable it was, and decided to try it for myself. 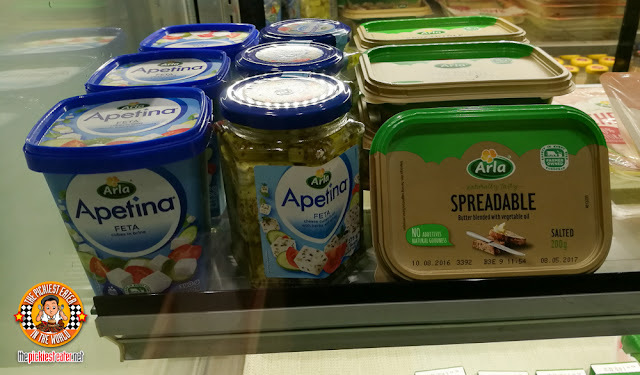 The following day, I had the Arla toast I had seen in my cousin's picture, and was not disappointed, making a Jar of Arla Cheesy Spread a staple in our grocery list. Which is why I excited when I found out that Arla had set up a Pop Up Station at SM Aura Premier, showcasing some of their delicious products, prepared as delicious combo meals that imbibe the clean type of eating Arla adheres to, within a budget friendly range! 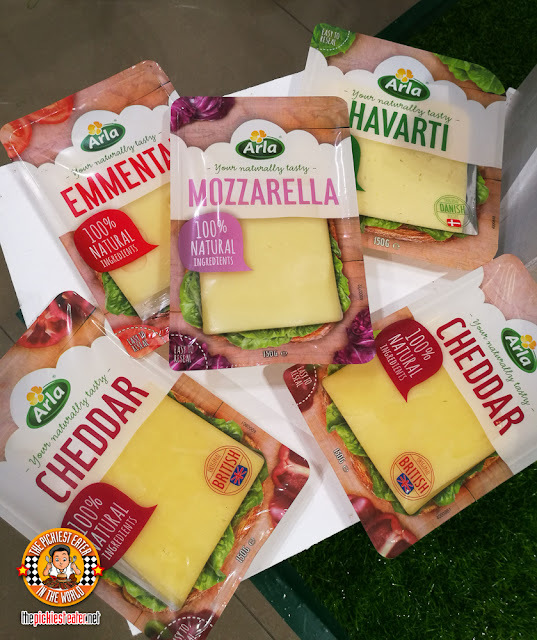 Arla Foods is an international brand that the world's largest manufacturer and producer of organic dairy products. 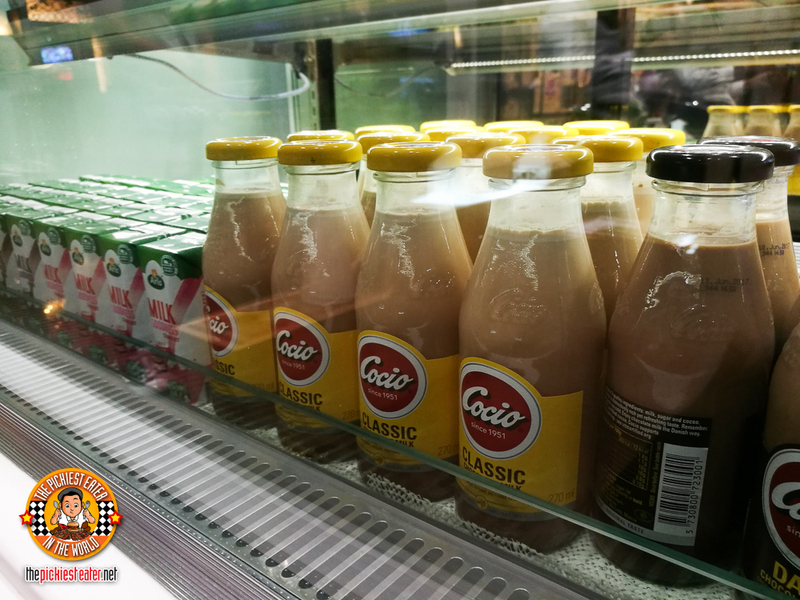 They take pride in providing fresh, premium and high-quality dairy brands to their customers. The products under the Arla Foods banner includes Cocio, Apetina, and even my favorite butter, Lurpak. 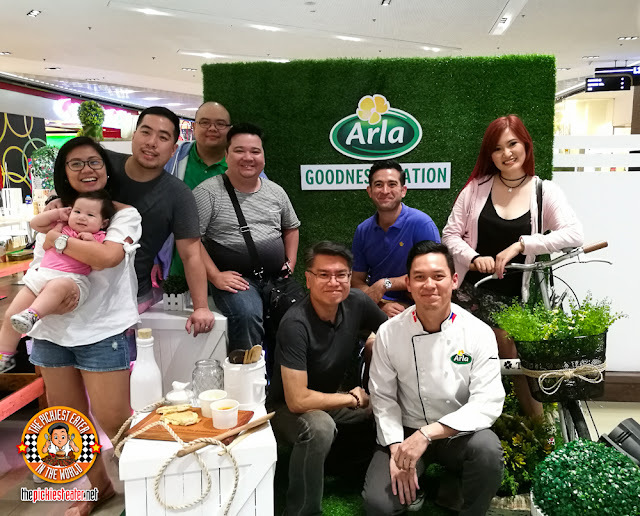 Using the plethora of quality products at its disposal, Arla commissioned Chef Deo Tayag to whip up some mouthwatering dishes that would showcase the high standard of taste that they stand for. Set A of the Arla Goodness Station features a Three Cheese Panini Sandwich, made with Arla Mozzarella, Gouda and Sharp Cheddar. 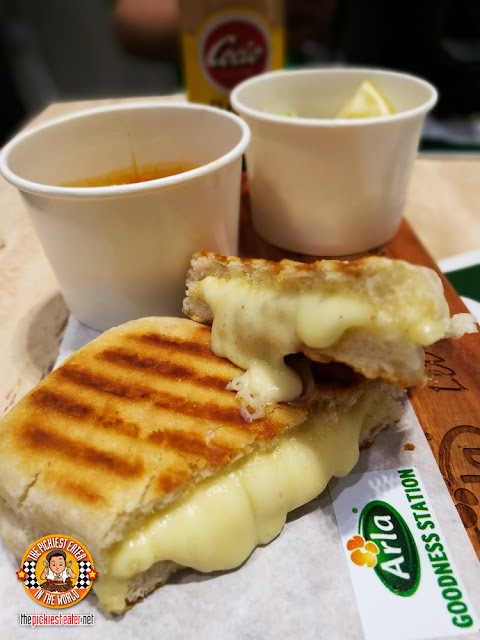 The blend of the gooey cheesy worked together to perfection, with it's individual traits complimenting one another harmoniously. The Combo includes a Greek Salad prepared with Arla's Apetina Feta Cheese in oil, and a rich Roasted Tomato Soup which was given a new dimension of creaminess by a dollop of Arla Cheesy Spread. 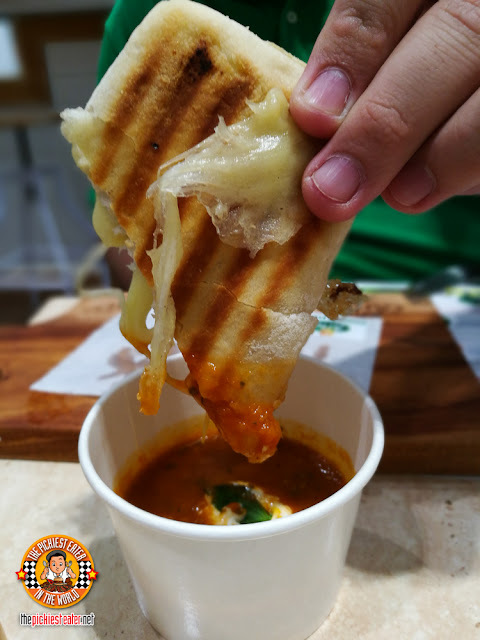 The delicate acid of the Tomato Soup cuts right through the rich medley of cheeses, giving you an amazing play of flavors and textures! 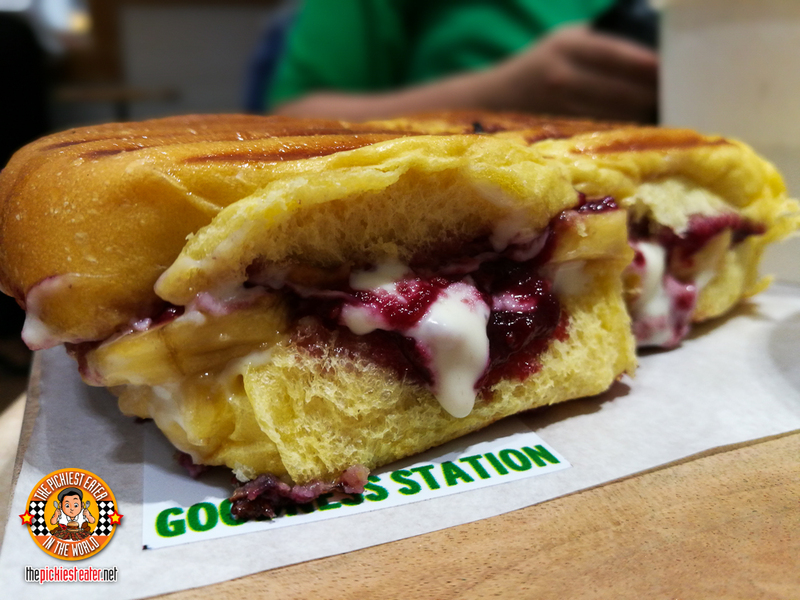 Chef Deo was going for comfort when conceptualizing his Peanut Butter and Jelly Sandwich. This delicious sandwich was made with Crunchy Peanut Butter, Bananas, and homemade Jam, and a smearing of Arla Cheesy spread. Truly a Peanut Butter and Jelly-Banana Sandwich that would make Elvis proud. 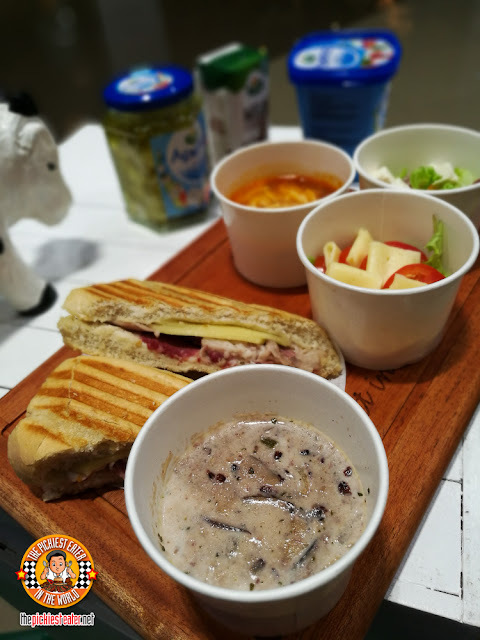 Included in the set is Brown Rice and Caramelized Mushrooms made even better with Arla Whiping Cream, and a Garden Salad with Seasonal Fruit, speckled with Arla's Apetina Feta Cheese. 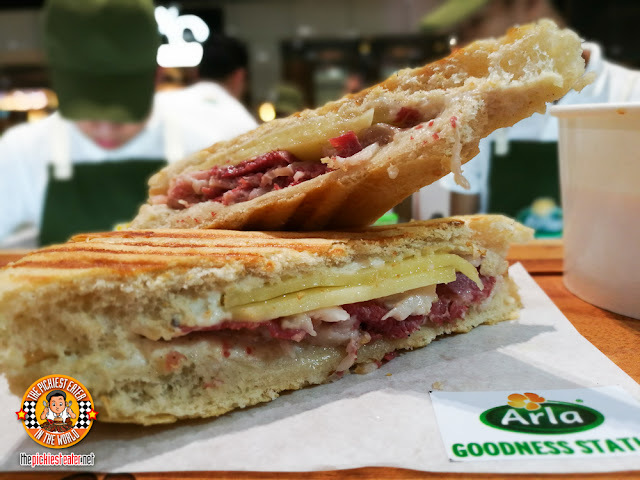 I love me a good Corned Beef Sandwich, and Chef Deo's version, made even more amazing with slices of Arla Gouda Cheese, First off, the Corned Beef itself is phenomenal. And when the Corned Beef meets the tangy horseradish cream, and the creaminess of the Gouda, the natural flavors of the meat is further accentuated. 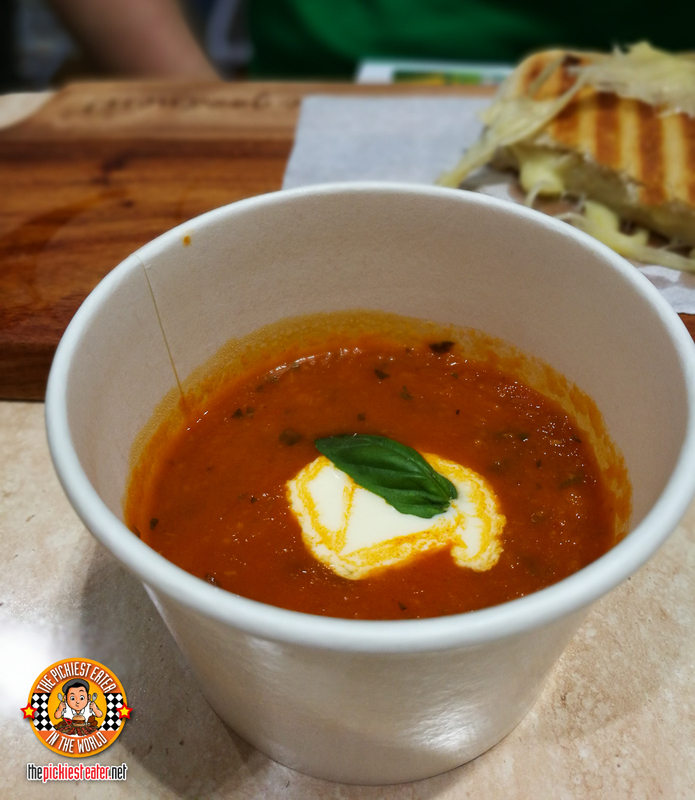 The set comes with Chili Con Carne that is topped with a generous heaping of Cheddar Cheese, and a Caprese Salad that is tossed with Arla Harvati Cheese. 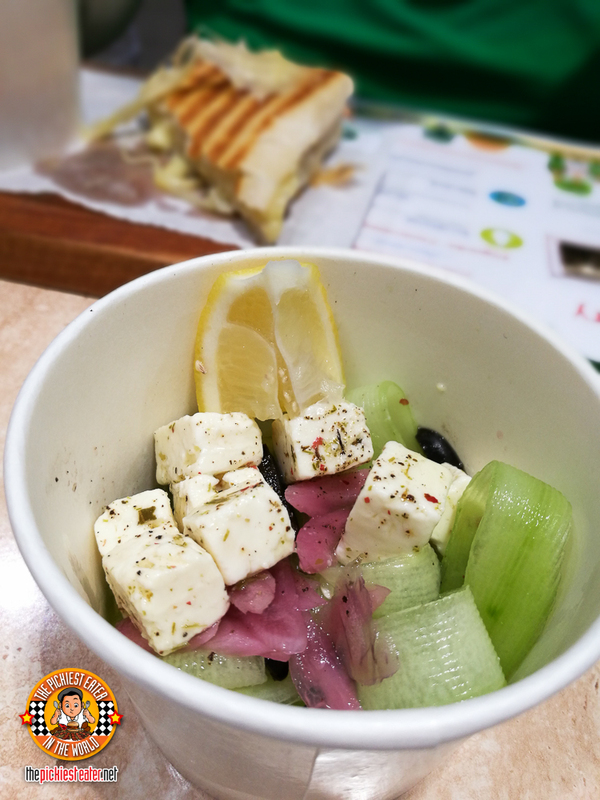 If you can't decide on which set to attack, you can opt to mix and match your Soup, Salad and Sandwich! Truthfully, you can't go wrong with either one, but if I were to choose a favorite among the sandwiches, my favorite was the Corned Beef, and just a few notches lower, the Three Cheese, followed by the PB & J. However, I encourage you all to try these delicious creations for yourself and decide which one you like the best! 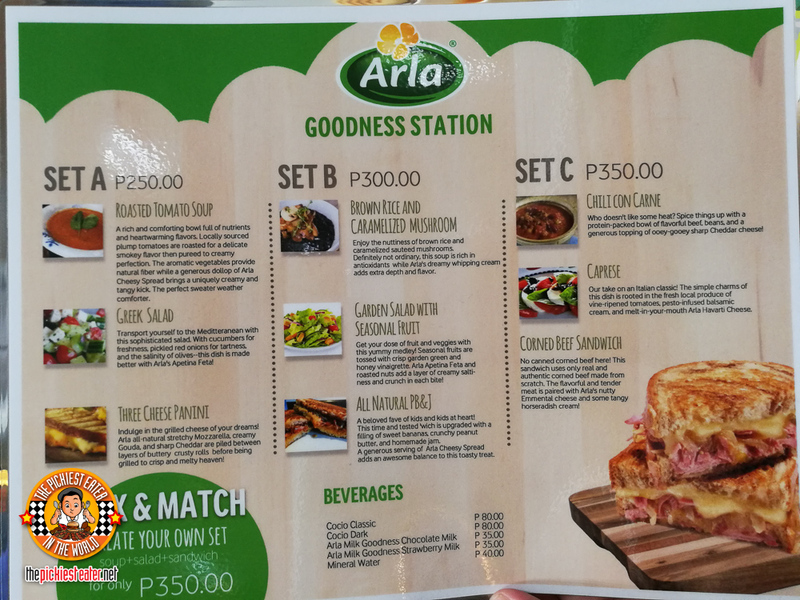 You have until February 28 to run on over to the SM Aura Premier and try the delicious dishes made from Arla products yourself, so don't miss out on Letting the goodness in! All Organic Full Cream Milk, as well as Chocolate and Strawberry Milk! Apetina Feta, and Arla Spreadable Butter! 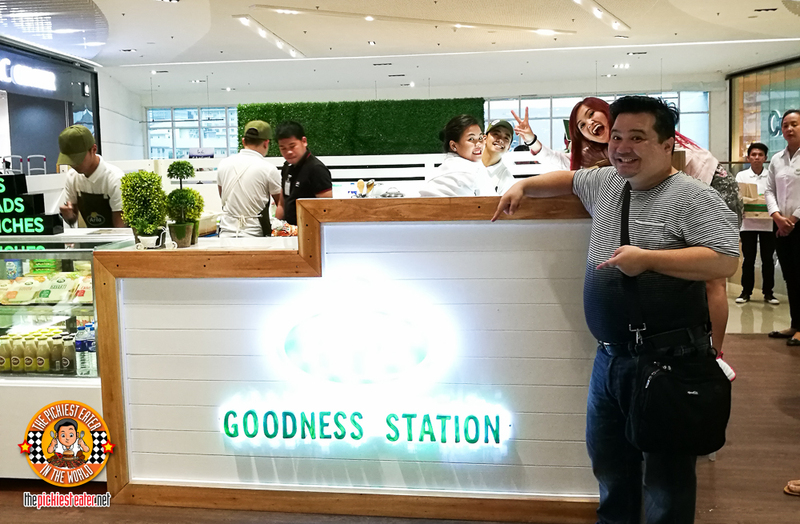 A special shout out our friends at Arla and Geyser Maclang, especially Marco Lobregat for having us over to #GetReal and #LetInTheGoodness at the Arla Goodness Station! 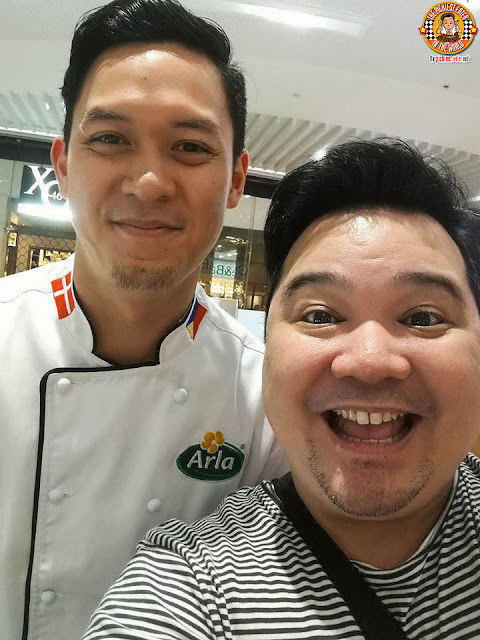 Like Arla PH on Facebook!